The column in this court was erected and dedicated in the year 2000 AD in the centre of what was formerly the cloister courtyard of the monastery of the Knights Templar. The Templars were founded in 1119 to protect pilgrims in the Holy Land. The column is in gothic style, modelled on the Purbeck marble columns in the church. 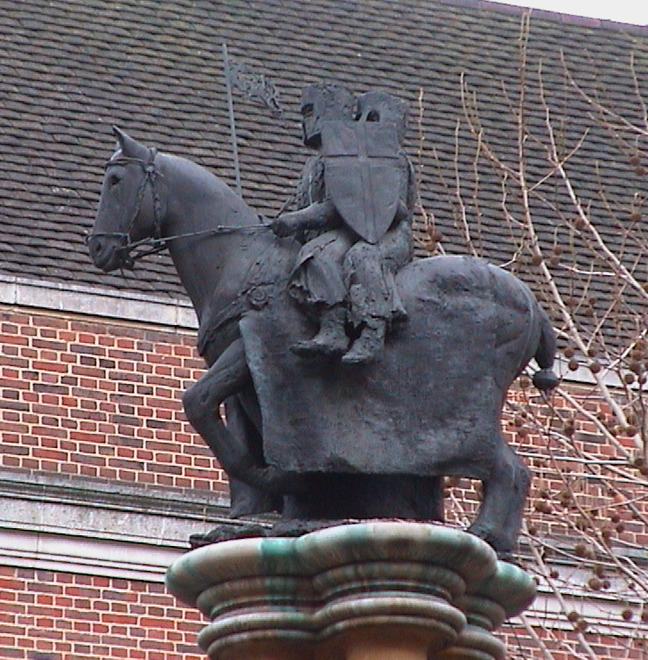 The image of the horse with two riders is derived from the seal of the knights who were originally too poor to have a horse each. The same image can be seen depicted in the east window of the church. The column also marks the point at which the great fire of 1666 was extinguished. The church was saved and the old gothic order survived. The column thus contrasts with Sir Christopher Wren's monument in the City, which stands where the fire started and marks the arrival of the new classical order. The overall design was in the hands of Tom Stuart-Smith. Ptolemy Dean designed the column. The sculpture is by Nicola Hicks. The inscription was carved by James Honeywood. It means "Lest the Temple should be without a memorial of the start of the third millennium the Inner Temple caused this monument to be erected for the greater glory of God." The London Plane trees were presented by Christian Bevington, a Bencher of the Inner Temple, in memory of Canon Joseph Robinson, Master of the Temple from 1980 - 1999. 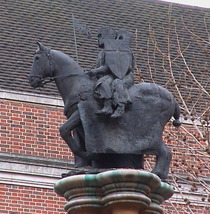 The column and sculpture were the gift of Lord Lloyd of Berwick, Treasurer 1999. The column is about 10 m high. The statue on top is bronze. On the ground of this court two circles are marked out in the flags, one has the column at the centre, the other is centred on the Lamb Building plaque. This court was formerly the cloister courtyard of the monastery of the Knights Templar. Master of the Temple from 1980 - 1999. Treasurer at the Inner Temple, 1999. Architect. Brother of artist Tacita Dean. Grandson of film director Basil Dean. Niblett Hall was replaced with Littleton Building in 1994.